Membership Fee - $100.00 annually. Due at AGM late June. Members are classified as Foundation Memberships and Gold Memberships. FOUNDATION Members are the small group of local hot rod enthusiasts that stood up to be part of the original formation group. GOLD Memberships are the next members up to 1000 and they are from varied areas in hot rodding and also out of hot rodding. Members can be a combined unit, husband and wife, individual business, club, etc. 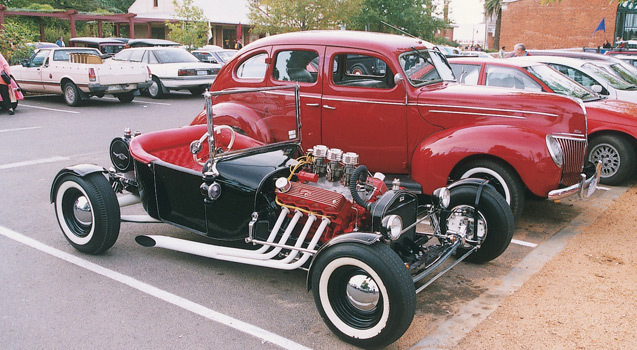 There are many advantages to becoming a member of the Castlemaine Hot Rod Centre Ltd, besides it being a very exciting project, we have listed some other advantages. The Castlemaine Hot Rod Centre Ltd is a 'not for profit' company therefore your fees help us with administration expenses. Every member will receive a newsletter quarterly. Members are encouraged to share any ideas they have regarding any aspect of our project. We welcome all input. Members are also invited to attend our general meetings. Special prize draws for members only, prizes are weekends in Castlemaine with activities organized for winners. For example - visits to garages and workshops that you would not normally get to see. There will be other advantages as the project takes place and especially when we are up and running. Castlemaine Hot Rod Centre is guided by a board.